If you love cooking, kitchen and other household items, imagine a building the size of McCormick Place in Chicago filled with everything you could ever want. Not only that, many products are not even on the market yet and you are the first to get the inside scoop! 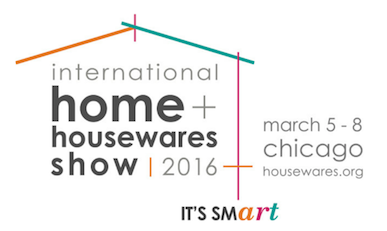 The International Home & Housewares Show is for you. It’s held every year and my daughter Kristina and I never miss it, as it is one of our favorite adventures together. This year it opened the first weekend in March. 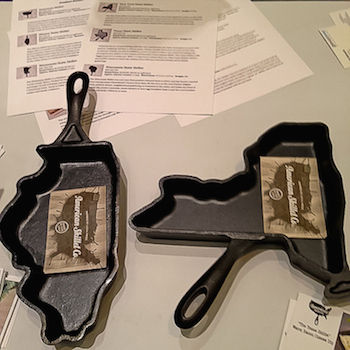 At a nearby table was the American Skillet Company featuring made in the USA cast iron skillets in the shape of our states along with recipe cards for each. The skillets are not huge so they can also be used as a serving piece for a whimsical and festive look on a serving table for things like cold foods or dinner rolls. They are adorable! After walking around the room for a few more minutes, it was time for the large exhibitor areas to open. 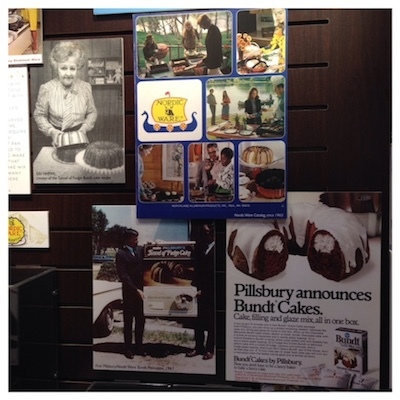 One of first places in view is Nordic Ware, one of our favorites. 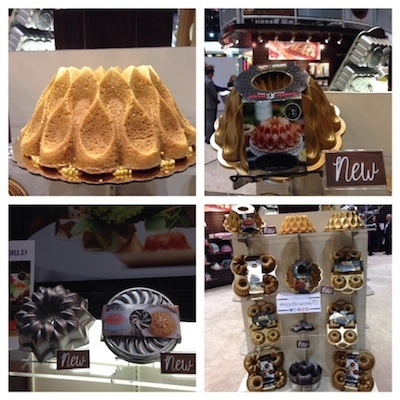 Every year there is a new shape or style of Bundt pans. 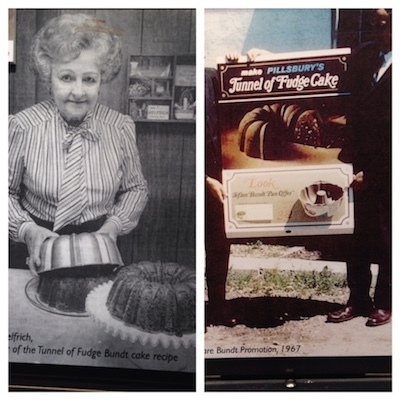 Speaking of Bundt pans, I was thrilled to see a display all about the inventor of the Tunnel-of-Fudge Cake, who was a contestant at a Pillsbury Bake-Off. 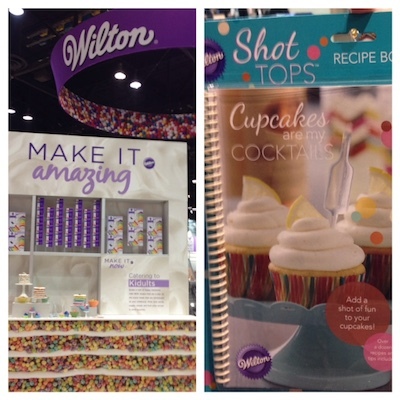 Next to Nordic Ware was Wilton that introduced a new product for cupcakes called “Shot Tops.” A special injector is inserted into cupcakes to infuse them with your favorite liquor for extra flavor and moisture. Cupcakes become cocktails! For adults, of course. 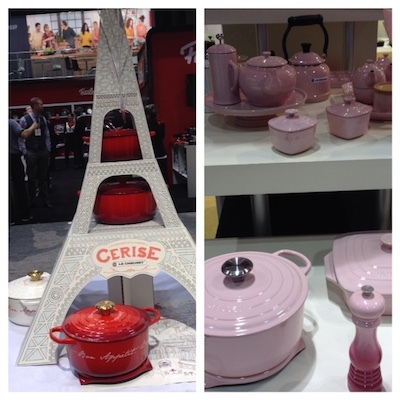 A few aisles over we found another favorite, LeCreuset. We never miss it and love seeing what the new color of the year is being introduced. This year it is “hibiscus” and it is gorgeous! Look at all the variety of hibiscus cookware on the right, and some specialty pans on the left. I could have carried them all home. About this time, the aroma of something cooking filtered across the aisles and we knew the Cooking Theatre must be nearby. 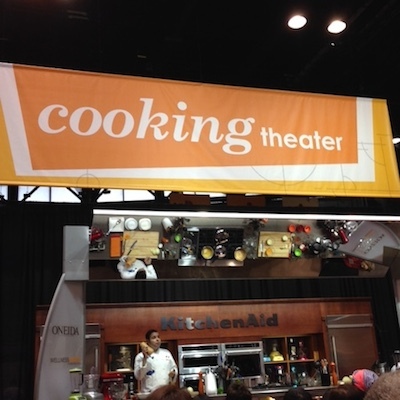 Most years, Kristina and I will sit for hours and watch all the celebrity chefs demonstrating some great dishes, but since we only had one day this year, we sadly couldn’t stay to watch them. Sorry, Rick Bayless. I missed seeing you. 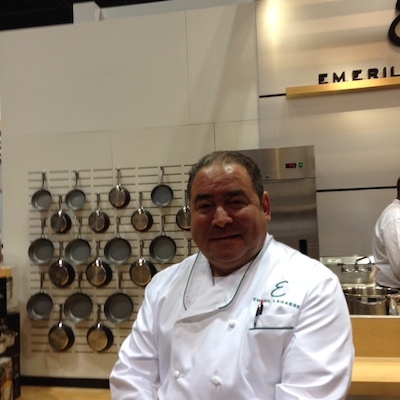 However, we were able to say hi to Emeril! 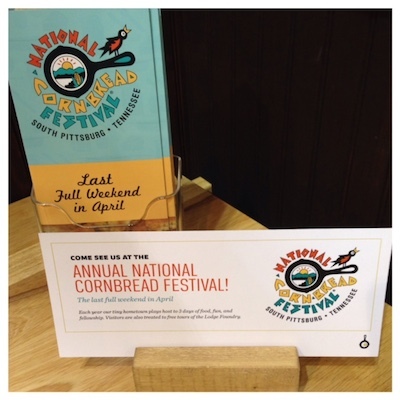 We stopped by the Lodge booth to see if they had any info on the upcoming Cornbread Contest, and of course they did. Kristina is so proud that every contestant this year are members of her site, Cooking Contest Central! 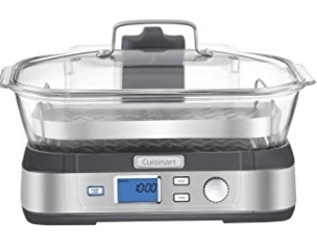 Cuisinart has a great new digital glass cook fresh steamer. It has a powerful steam system that delivers steam from the top down surrounding food to cook quickly and evenly for healthy cooking. We found lots of fun new gadgets. 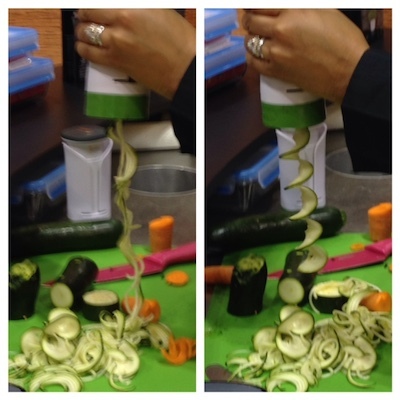 Making vegetables into spirals is trendy at the moment, but some of the products to make the spirals are large and clunky. 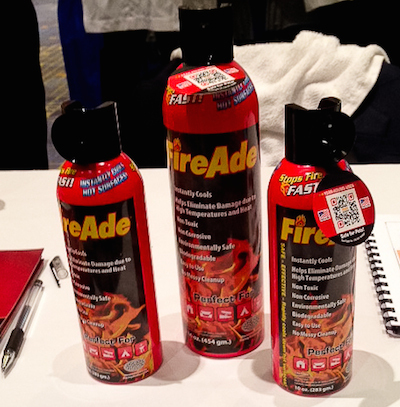 We found a great hand-held one that is light and easy to store. 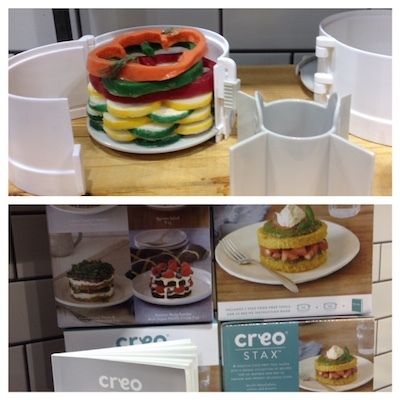 One item I loved was the “stax” from Creo. I love the way food looks on a plate stacked up in beautiful layers. Kristina and I also decided it would be a great way to make individual Finnish sandwich cakes. 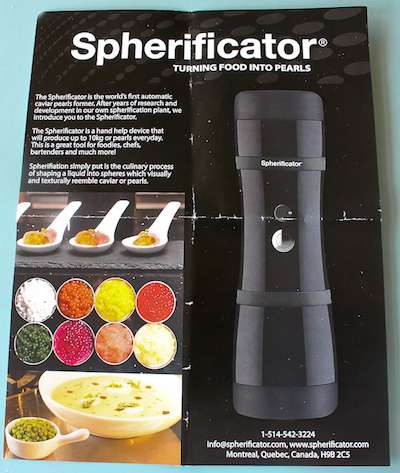 If you really want to go all Top Chef in your kitchen, you need to buy a “Spherificator.” With this item, any food item can be made into little pearls or tiny caviar-looking pieces. Go check out the site and see how cool it looks. You think that is different? How about this! 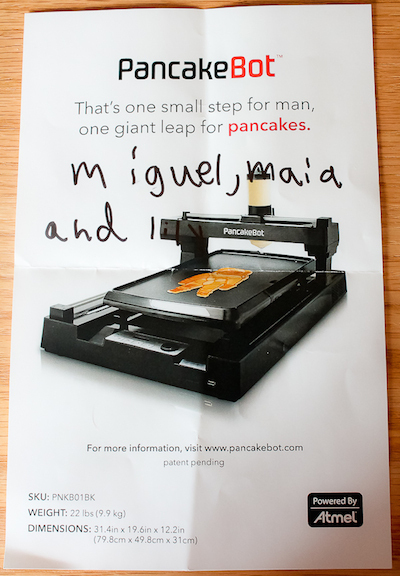 Presenting the “Pancake Bot.” By using your computer, images are made that can be transferred to make any shape of pancake! While Kristina and I were finding all kinds of things we liked, Bill was finding items of his own. 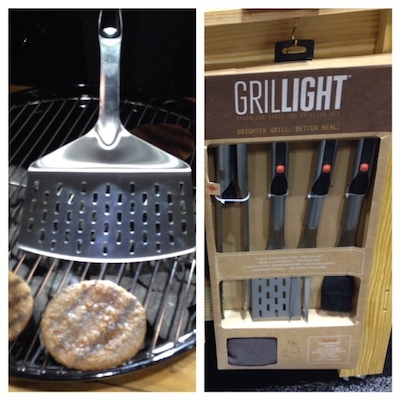 He loved these grill utensils from Grillight with built-in lights to see in the dark when camping or even in your own backyard. Not only that, but all the utensils seen here are magnetic and will attach to the included apron so you won’t lose them while grilling in the dark! Speaking of camping and being in the dark, here is way Bill loved to keep the camp lit up. When bottles are empty, make them into hanging lanterns. 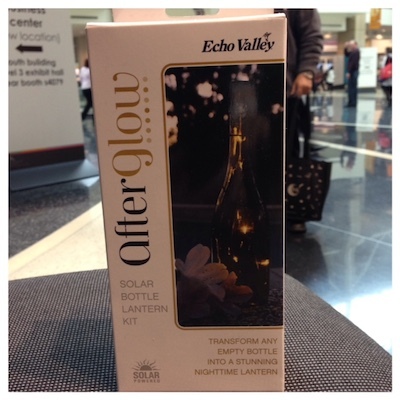 We tried one – it was beautiful! They are solar-powered. Check out the site. Another fun item from some really nice people from Great Plate. 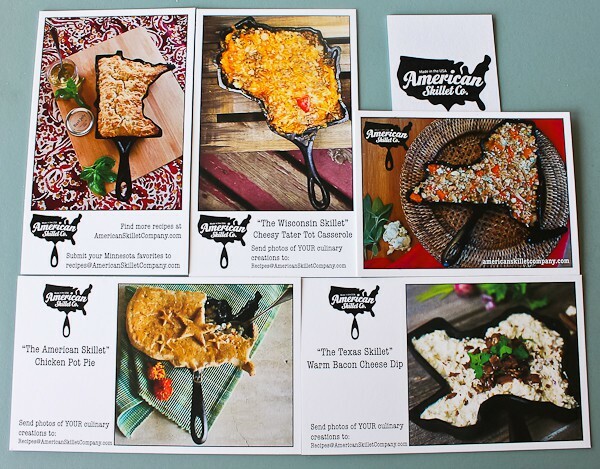 These durable plates are great for camping, picnics, backyard barbecues, or anywhere you need plates. They are easy to carry, don’t tip over, the center section can hold a bottle or cup or it can hold a dip. 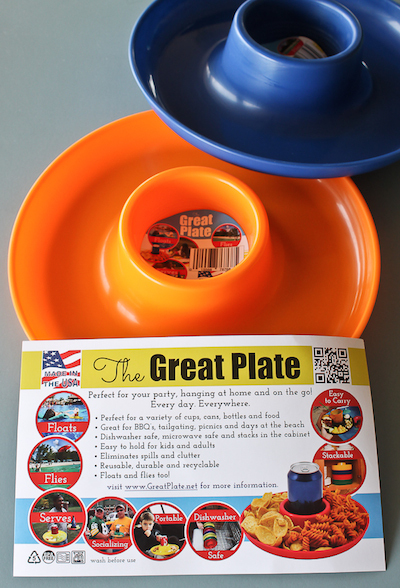 The fun part comes when the plate is done being used as a plate, it turns into a frisbee! With Game of Thrones returning next week for a new season, these caught his eye. 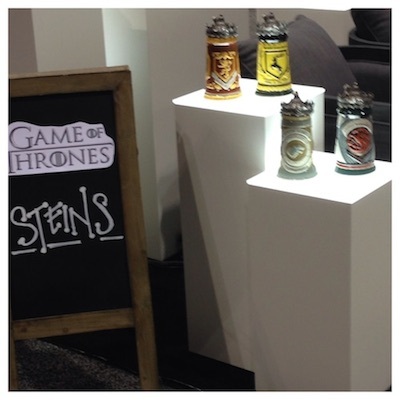 G of T beer steins! And lastly, I think many cooks will be thrilled with this newest item: it’s a mini KitchenAid stand mixer! It’s as powerful as the regular stand mixer and all the attachments will still fit. How about that! After a long day of fun at the show, it was time to go check into our hotel. Our favorite place to stay is always the fabulous Four Seasons Chicago. Not only is it in a great area with a view of Lake Michigan, the staff are all extremely friendly and the food is the best. 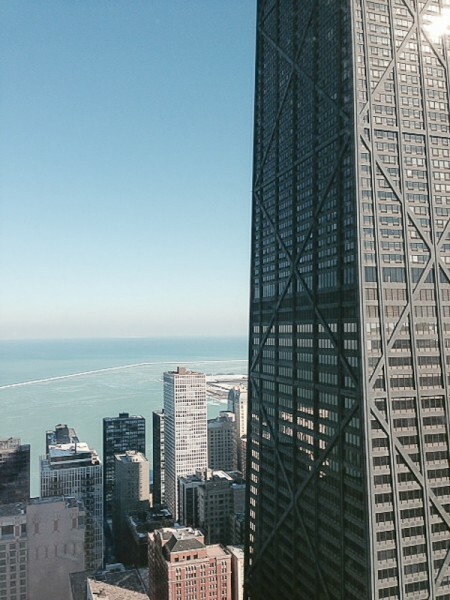 The view out of our window of the John Hancock Building and the lake. Bill dropped us off at the hotel and drove back home. Kristina and I were staying the night because the day was not over for us. We had to get ready to have dinner with our friends Rachel and Dan from Rachel Litner Associates who represent Cuisinart. 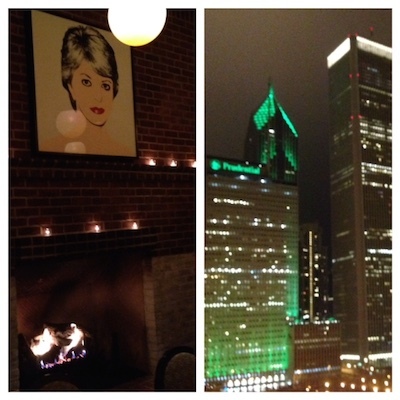 We were invited to dinner at Cindy’s Rooftop restaurant at the Chicago Athletic Club overlooking Millenium Park. 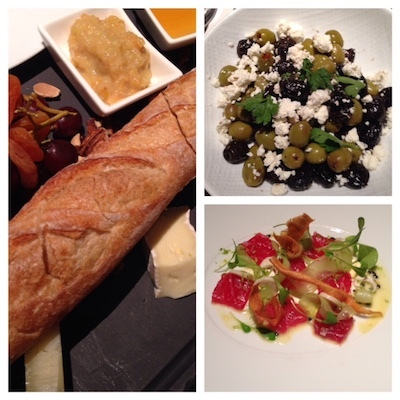 We had not eaten all day so had a few appetizers to nibble on sent up to the room to hold us over until dinner. The beautiful tray included freshly baked bread with a variety of cheeses, nuts, dried fruit, chutney and honey; salmon with a little caviar, and some green and black olives with feta. It was finally time to leave for the restaurant. We always look forward to seeing Rachel, Dan, Cuisinart associates, and all the other food writers and editors every year. It’s the best part of the show as far as we’re concerned! We had never been to Cindy’s before and were curious as to who Cindy was. There was a giant portrait of Cindy in our private dining room. We found out that Cindy was Cindy Pritzker, as in Pritzker Pavilion in Millenium Park right across the street. There was also a stunning view on the other side off the balcony. We enjoyed dinner and all the conversations. 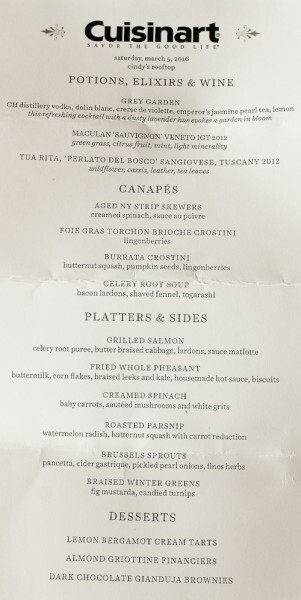 By the way, here was our wonderful menu. 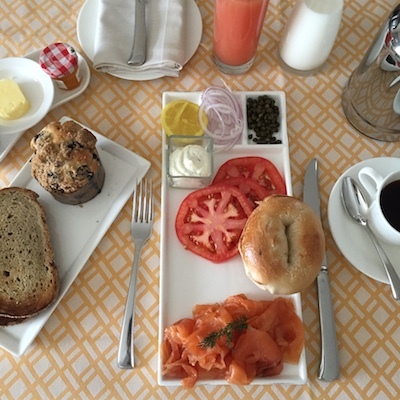 We woke up the next morning and ordered breakfast, one of our favorites with smoked salmon. Now it was time to go and wait for next year’s show. It’s always an adventure. 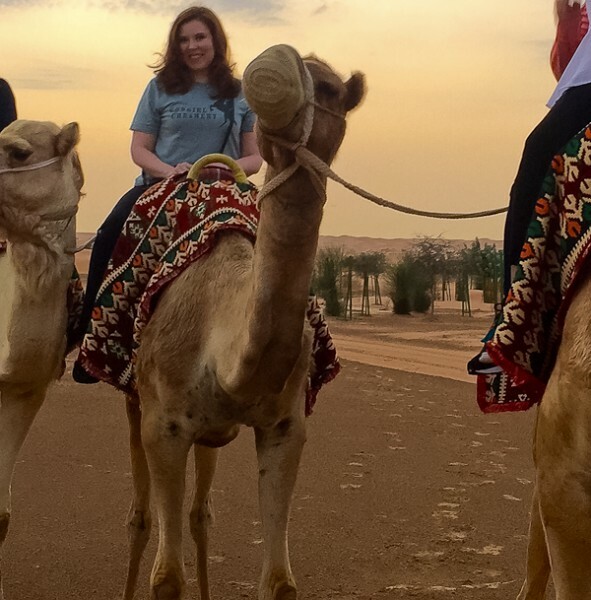 Maybe not as adventurous as taking a camel to get to dinner, but still great fun. We are already looking forward to next year. Lisa, one of these years you must come! You would love it!! And when it’s over we can play in the Culinary Cellar. Do you remember you were the first person to see the card catalog when I got it? It certainly was, Barb! I’m so glad it’s right in our backyard. And they say that Disneyland is the happiest place on earth! 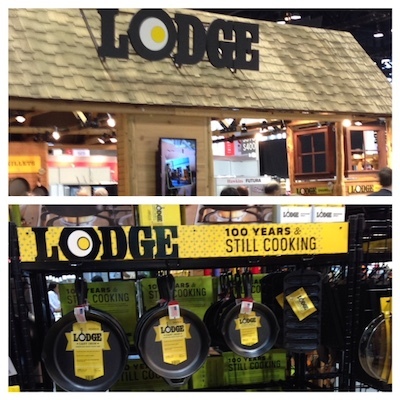 For anyone who enjoys cooking, I think you found our happy place at the International Home and Housewares Show! It definitely is a Disneyland, Kim! Wish you could go with us someday. Thanks for the recap Debbie!! Looks amazing!! Hope to see you there next year! I hope so, Tina! 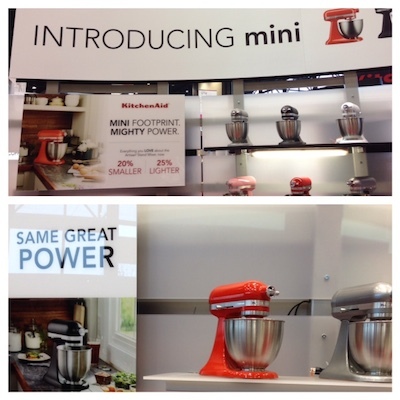 We loved the mini KitchenAid. Hope to see you using it on TV! It was! You would love it too.